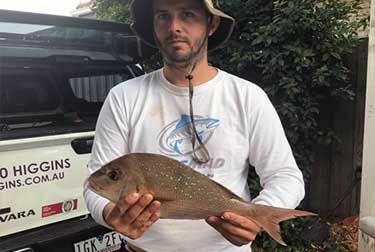 Michael Smith and his brother fished the reef of Millers road Altona in the early morning during terrific conditions in search of Snapper. The guys ended up landing a dozen pinkies between 30cm and 50cm. The guys were using Zman 4” Streakz Curly Tailz in baby bass colour on 1/8 jig heads and procure mullet scent. They then changed up plans and drifted flicking TT switchblades vibes about a 100m west of Altona Pier for a few flathead around 35cms.